How does Quick Article Pro3.0 work? Here, you can add a new article, delete previously added article and edit an article. 1. 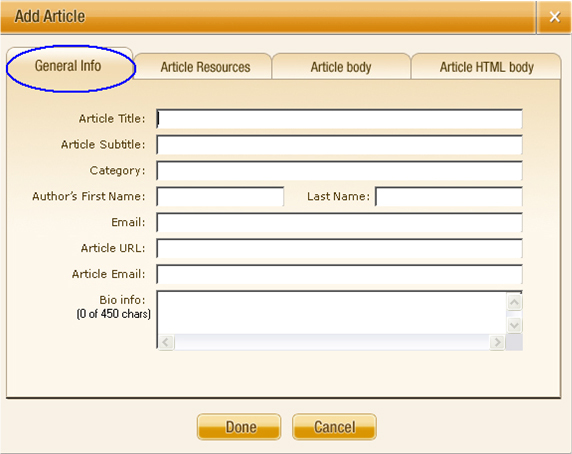 Select article - This is a drop down that has the name of the articles that has already been added by the user. 2. Add article - This option allows you to add a new article. When you click Add Article button, you will see various tabs, where you are required to fill the article information required by the article directory you are about to submit to. Below, you will see an explanation for each of these tabs. i. General Info Tab: Here, you are required to fill information for your article such as Article Title, Article Sub Title, Category, Author’s First Name, Email, Article URL, Article Email and Bio info(0 to 450 characters). The title of every article is what appears in the Select Article Drop down. ii. 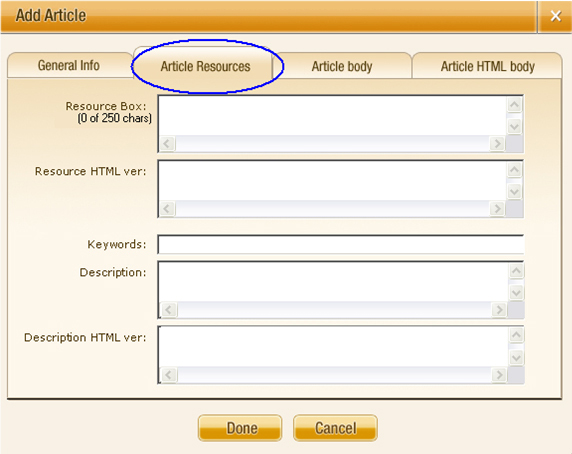 Article Resource Tab: This tab allows you to enter information about the article resource in the Resource Box, resource information for HTML version, a brief description of your article, brief description HTML version, as well as some keywords that relate to your article. The Resource Box has a maximum limit of 250 characters. In many cases, the information entered in this tab is what will be used by the article directories’ visitors to help find the types of articles they are searching for. iii. 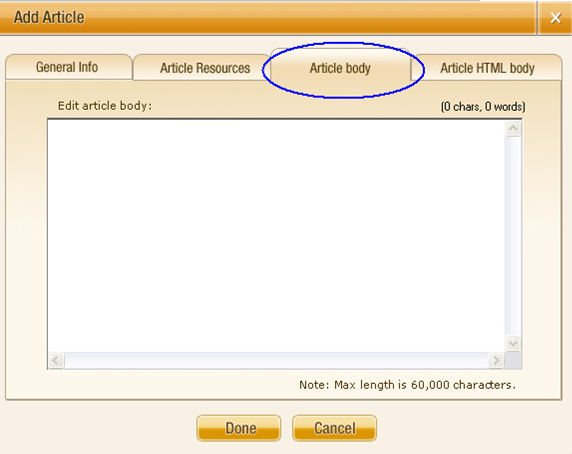 Article Body Tab: This is where you will be able to enter the actual article itself. You can simply paste your article in “text format” into this text box. Do not enter HTML into the Article Body Tab. The top right corner shows the number of words and characters in the article body. iv. 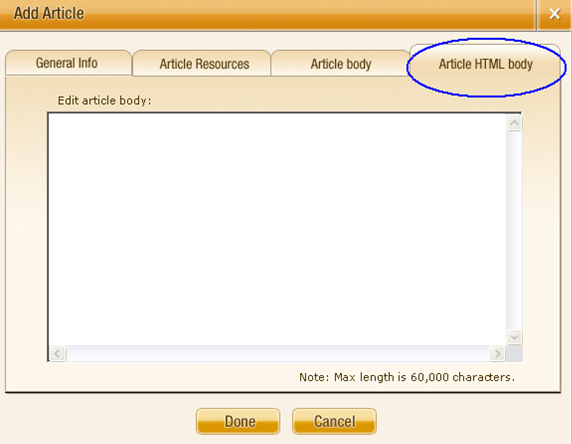 Article HTML Body Tab: This tab works identically to the Article Body Tab discussed above. The only difference is that you are required to enter HTML formatted article into this text box. If you don’t know HTML, don’t be too concerned. You can simply input the same text into the Article HTML Body Tab as you did into the Article Body Tab, and that will work just fine. 3. Delete article - This allows you to remove the selected article (in the article drop down) from Quick Article Submitter. 4. Edit article- This allows you to edit the selected article (in the article drop down) within Quick Article Submitter.